Context: the average year-round Arctic sea-ice area is about 8.919 million sq. km. 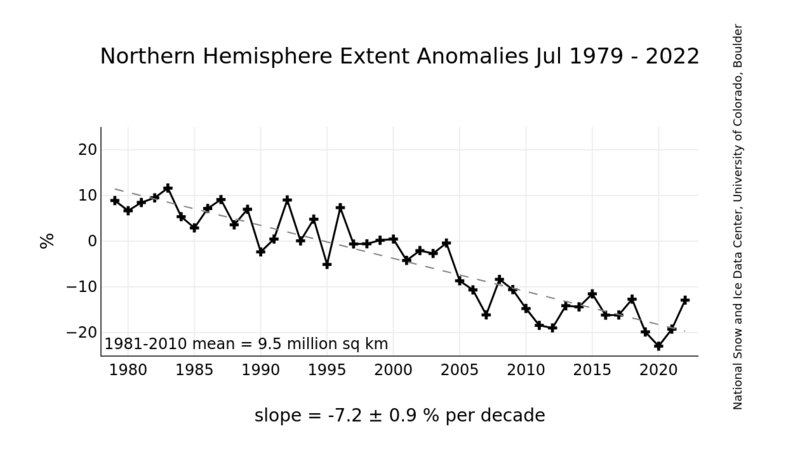 In the Spring of 2016, when the satellite responsible for sea ice measurements degraded and interrupted the data series, the Arctic ice area was down about 11% (about 1/8.919) million sq. km) below the 1978-2008 average for the date. The Special Sensor Microwave Imager and Sounder (SSMIS) on the Defense Meteorological Satellite Program (DMSP) F-17 satellite that provides passive microwave brightness temperatures (and derived Arctic and Antarctic sea ice products) has been providing spurious data since the beginning of April, 2016. The data showed a declining sea ice extent over the 1979 to April 2016 period. (Source: Department of Atmospheric Sciences at the University of Illinois.) This graphic is no longer published by the University. You can also see what the satellite is seeing and Today's Ice versus other recent years from the International Arctic Research Center, showing that this year's ice is well below the average for the warm months. 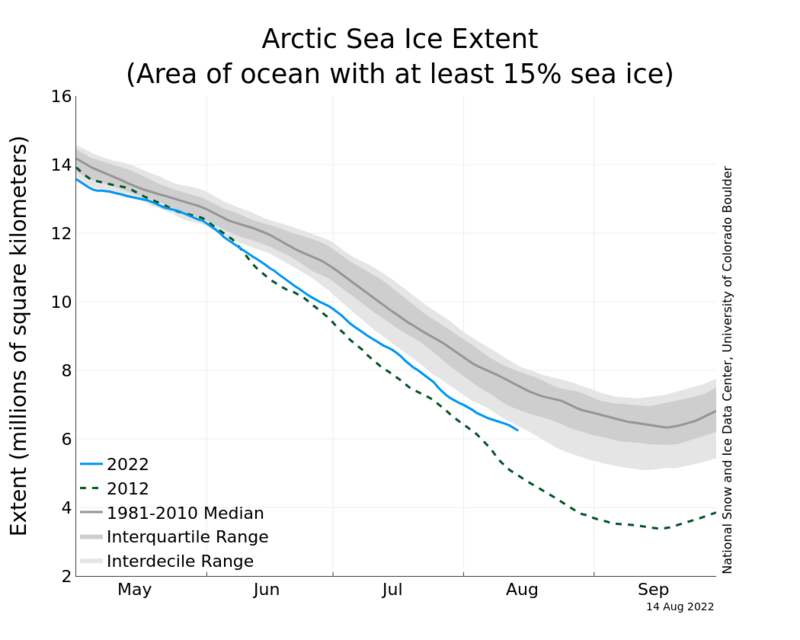 Analysis: The Arctic sea-ice extent cannot be used alone as an indicator of warming or cooling, because it must be viewed in concert with Antarctica. Also, data only go back to 1979, when satellite sensors and analytical programs could get a handle on measuring sea ice. Even today it has problems, such as dealing with water on ice, as happens after a warm spell. The sensor sees water, not ice, but this does not mean the underlying ice is gone. If the Arctic loses ice, but the global balance is about the same, there is no GLOBAL warming. More importantly, we must wonder what the satellites would have observed when Roald Amundsen explored and sailed through the Arctic on the small ship Gjøa since the Northwest Passage was open to sailing vessels in 1903-1905, and again in 1940-42 and 1944 (St. Roch), it is possible the recent reduction in Arctic ice is a normal part of the Earth's variable climate. On the left, the University of Washington Polar Science Center maintains a daily analysis of Sea Ice Volume. It is calculated using the Pan-Arctic Ice Ocean Modeling and Assimilation System (PIOMAS, Zhang and Rothrock, 2003) developed at APL/PSC. Anomalies for each day are calculated relative to the average over the 1979 -2016 period for that day of the year to remove the annual cycle. 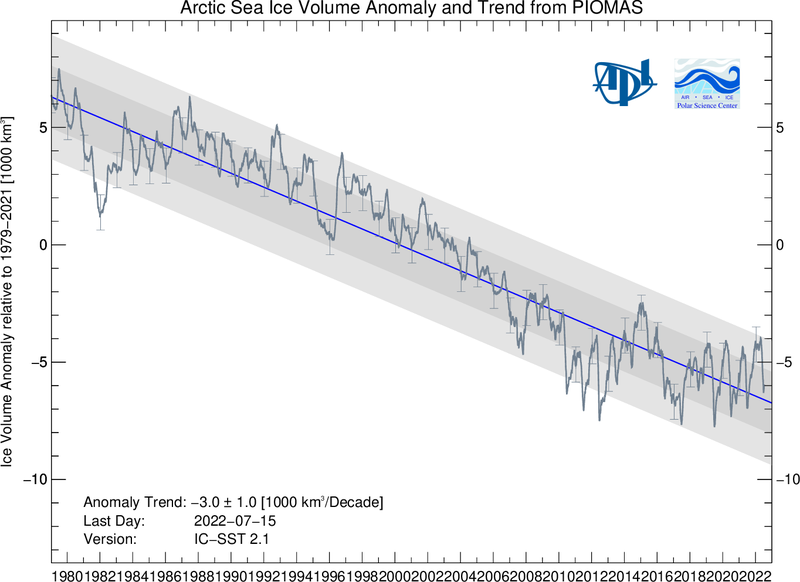 The model mean annual cycle of sea ice volume over this period ranges from 28,000 km3 in April to 11,500 km3 in September. The blue line represents the trend calculated from January 1 1979 to the most recent date indicated on the figure. Shaded areas represent one and two standard deviations of the residuals of the anomaly from the trend in Fig 1 and standard deviations about the daily 1979-2016 mean. Analysis: Per UW, Average ice thickness in April 2017 is the lowest on record, going back to 1980. On the right, the National Snow and Ice Data Center shows a map-based view. "In October2016, Arctic sea ice extent averaged 6.40 million square kilometers (2.5 million square miles), the lowest October in thesatellite record. This is 400,000 square kilometers (154,400 square miles) lower than October 2007, the secondlowest October extent, and 690,000 square kilometers (266,400 square miles) lower than October 2012, the third lowest. The average extent was 2.55 million square kilometers (980,000 square miles) below the October 1981 to 2010 long-term average." On the bottom left is a graph from the National Sea and Ice Data Center at the U. of Colorado. For April 2017, they report "Throughout the month, sea ice extent was either at daily record lows for the period of satellite observations, or within 100,000 square kilometers (~38,600 square miles) of record low values. At the end of the month, extent was below average in the Barents Sea, the Sea of Okhotsk, and the western Bering Sea, similar to the pattern seen in March. 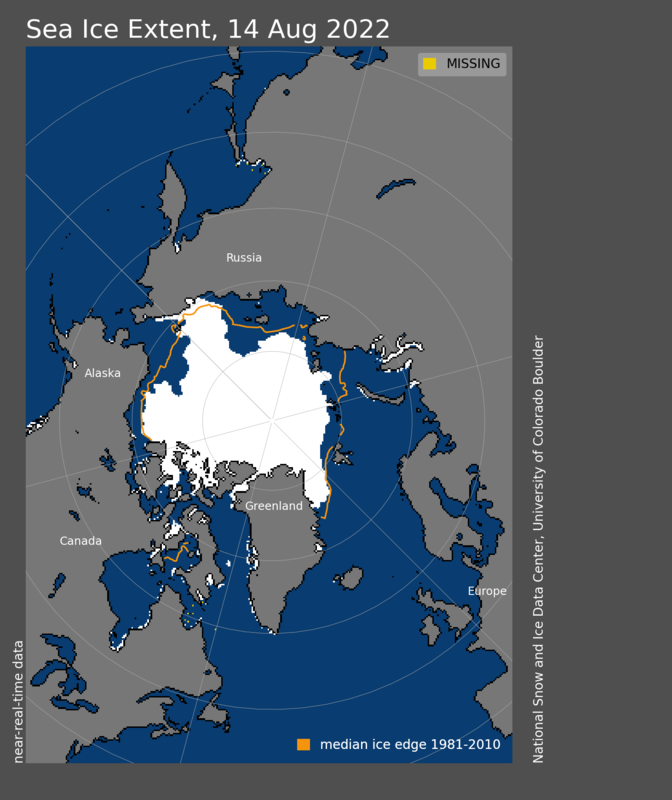 Despite fairly warm conditions, sea ice extent was slightly above average in Baffin Bay." Analysis: Conventional wisdom (and the IPCC) states that the poles will warm first. 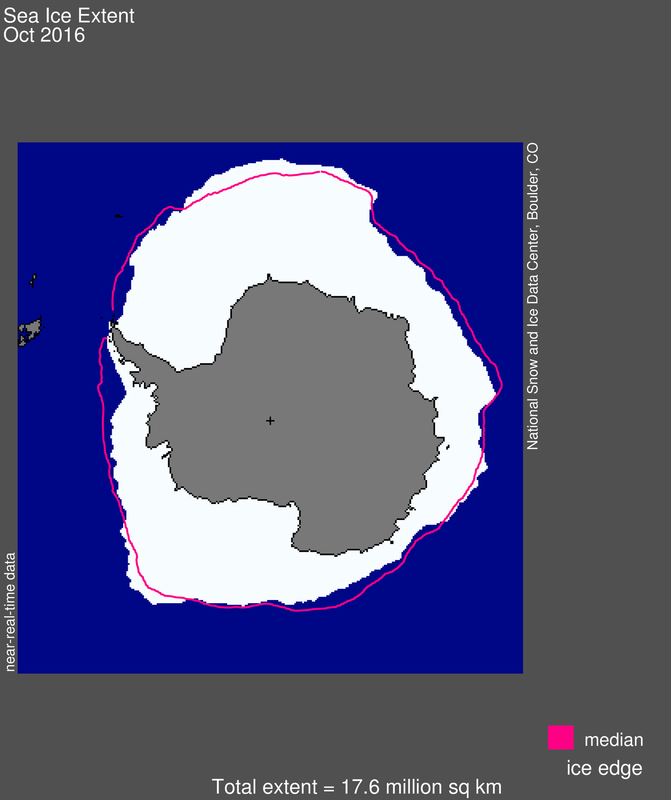 Clearly there is no or little change in the Antarctic, but there is apparent reduction in the Arctic. 2012 was the lowest year and 2017 recovered but remains statistically low - just below 80% of the observations since 1981. What does this tell us? The Arctic alone cannot be used as an indicator of warming or cooling, because it must be viewed in concert with the Antarctic. Also, data only goes back to 1979, when satellite sensors and analytical programs could get a handle on measuring sea ice. Even today the technology has problems, such as dealing with water on ice, as happens after a warm spell. The sensor sees water, not ice, but this does not mean the underlying ice is gone. If the Arctic gains or loses ice, but the global balance is about the same, there is no global cooling or warming. Arguments attributing various rationales for global sea ice being relatively unchanged are not convincing. It is possible the reduction in Arctic ice is not an indicator of global warming, since it was balanced by record high Antarctic ice levels. The return of Arctic sea ice in 2008 to more normal levels and Antarctica remaining generally near the average has received little attention. In November 2016, The Cryosphere journal published a peer-reviewed study by Dr. Jonathan Day showing that Antarctic sea ice extent is unchanged from 100 years ago, as recorded by early explorers. Thus, when the Arctic NW passage was open as it is nearly today, the Antarctic was also as it is today. Since the models cannot explain how this is possible, this points to there possibly being some fundamental flaw in the hypothesis.